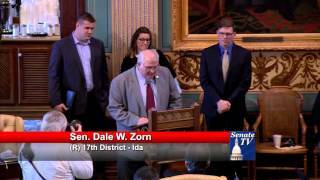 Senator Dale Zorn, R-Ida, welcomes Rev. 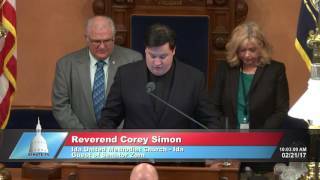 Corey Simon of Ida United Methodist Church in Ida, to the Michigan Senate to deliver the invocation at the start of the Feb. 21, 2017 session. 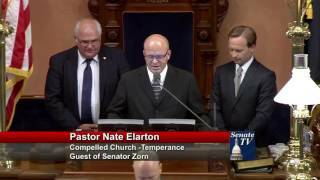 Senator Dale Zorn, R-Ida, welcomes Pastor Nate Elarton of Compelled Church in Temperance to the Michigan Senate to deliver the invocation at the start of the September 6, 2016 session. 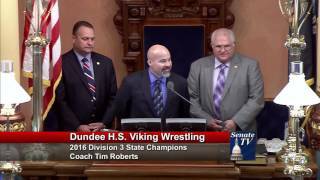 Senator Dale Zorn, R-Ida, welcomes the Dundee wrestling team to the Michigan Senate during the May 11, 2016 session. Senator Dale Zorn, R-Ida, welcomes Michigan International Speedway President Roger Curtis to the Michigan Senate during the March 10, 2016 session. 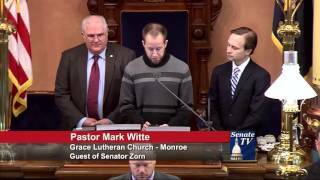 Senator Dale Zorn, R-Ida, welcomed Pastor Mark Witte of Grace Lutheran Church in Monroe to the Michigan Senate to deliver the invocation at the start of the Mar. 1, 2016 session.